Centenary Camp, in the northwest corner of the Florida Conference, has been a youth ministry since 1960. Photos by Susan Green. Click here to see additional photos. QUINCY -- Like any good story, the road to Centenary Camp has its share of twists and turns. To get there, motorists wind along back roads named for family farms to a spot about 2 miles off Quincy’s main drag. There they find a pine-filled 38 acres that have been a cradle for the soul for more than a half-century. The camp opened in 1960 in the heart of North Florida farm country. It began as a summer youth ministry for Centenary UMC, back when everyone in town knew everybody else and everyone knew Jesus. Today, the camp remains surrounded largely by cow pastures, tilled fields and pine forests, but the demographic and spiritual environment has changed dramatically. Young people who find their way to Centenary Camp these days often find more than nourishment for their spiritual journey; they find their way to Jesus for the first time. 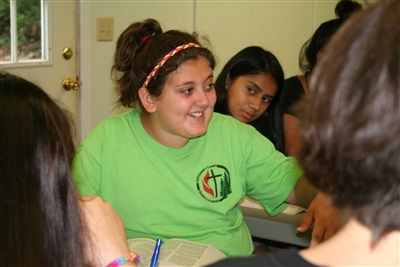 Julie Gaby, summer camp nurse at Centenary, remembers when children and teens of shared Christian heritage spent a chunk of the summer in fun and fellowship at the camp. An alumna of Centenary UMC’s youth ministry, she was one of them. Montana McQuaig, 14, reads a scripture from Isaiah at Centenary Camp Bible study. 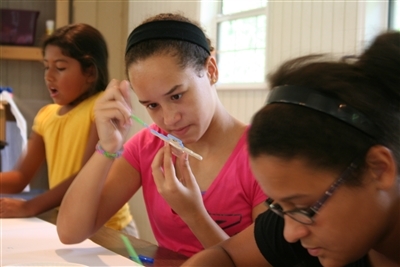 Syneria Melnyk, 12, of Sneads paints a cross ornament during crafts class at Centenary Camp. Young people from all backgrounds mingle together at Centenary Camp. Today the camp draws youngsters from varied backgrounds. African American and Caucasian children whose parents and grandparents were born here mix with children whose parents came from Mexico or Central America to work in the fields. Many have never been to church. “(For) how many of these kids is this the only face of Jesus they see?” Gaby said, reflecting on the camp’s metamorphosis over the years. And they’re not just hungry for spiritual knowledge. In impoverished Gadsden County, one of the poorest counties in Florida by per capita income, many would not get three meals a day without Centenary, Donna said. Some wouldn’t know how to swim if not for the camp pool and staff coaching. 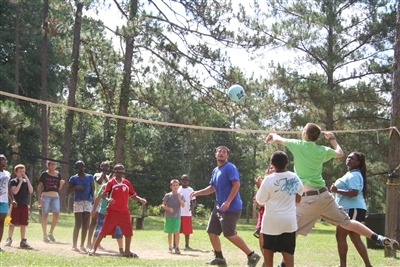 As with other camps operated by the Florida Conference, the summer program at Centenary mixes Bible study, prayer and devotions with activities like archery, volleyball and crafts. When the Brunses, who previously worked at Red Bird Mission in Kentucky, took over operations at Centenary, they found block buildings musty from disuse and rotting wood-frame, screened shelters. Centenary UMC had long since discontinued its program and was leasing the site for a nominal fee to the North West District. Rev. Jack Tilk, who became pastor at Centenary UMC about seven years ago, said the district was trying to interest local churches and other ministries in using the camp, but it was a slow-go. And nobody had money for repairs. Enter the Florida Conference. Tilk, who serves on the Board of Camps and Retreat Ministries, approached conference leaders about adding Centenary to its family of retreat facilities. Since the conference took over the site in 2009, the dormitories have received new roofs and the water and septic systems have been upgraded, Tilk said. 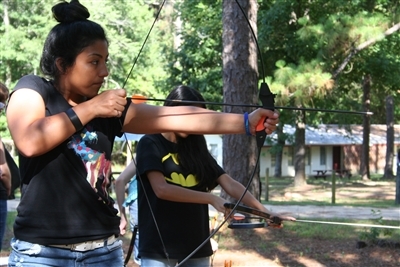 Above, Emely Carrillo, 14, of Gretna prepares to launch an arrow at a target in the Centenary Camp archery area. 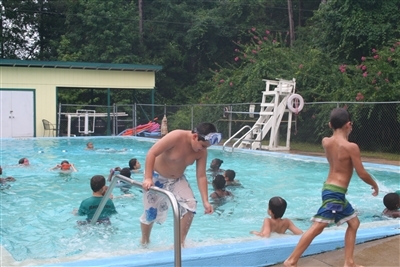 Below, volleyball and swimming are part of the camp's daily activities. Camp staff and volunteers have turned two of the decaying shelters into four-walled buildings for use as a chapel and multipurpose room. Painting, including hand-stenciling Bible words and scriptures to the walls of the dining hall, lodge rooms and common areas, has been a priority since the Brunses arrived. Tilk volunteers a lot of his time at the camp during the summer, along with Rev. Eddie Allen of St. Mary Christian Methodist Episcopal Church in Quincy and Rev. Bob Dehner of Greensboro UMC. The diversity of the camp and the camaraderie are striking, Tilk said. Three of Allen’s children attend the camp, which has programs for ages 9 through 15. Donna goes door to door in neighboring areas to recruit kids for camp each year. Many can’t afford the fees, so there’s fundraising to pay for scholarships beyond what the conference can provide. Children from as far away as Lake City attended this year. Between day camps and overnight programs, the camp serves more than 250 young people each summer. Often, when children at Centenary Camp are asked what they expect to do when they grow up, they start out by suggesting they’ll work in the fields or they will rely on government subsidies to pay the bills of everyday living. 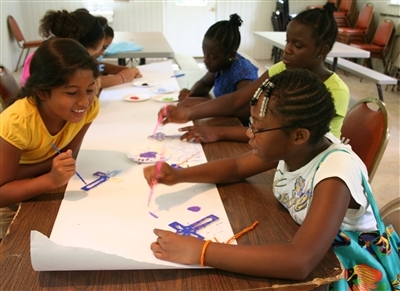 Camp counselors encourage them to envision a better life. Mictsi Carrillo of Quincy is among those inspired to dream because of her time at Centenary. Now 20 and a summer counselor, she began attending as a camper five years ago. “When I first came here, I was very shy,” she recalled. “Miss Donna made me feel really comfortable. 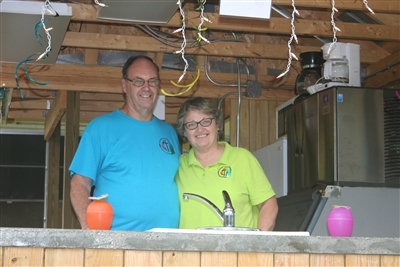 Dave and Donna Bruns stand in the snack hut where youngsters get drinks and ice pops during the summer at Centenary Camp. She is working toward a certified nursing assistant’s license and hopes to use it working with children with disabilities. Michael Hatfield, 16, is one of four boys from Eastpoint, about an hour away, who raise money in their community so they can attend the camp each summer. Hatfield was a counselor-in-training this year. Syneria Melnyk, 12, of Sneads has been attending the camp for two years. She said she likes being in small groups that make it easier to talk and share ideas. Now that the buildings are in better shape, the Brunses said they would like to see more use of the camp for youth and adult retreats during the winter months. They would like to enclose the remaining wooden shelter to create another multipurpose room, and they would like to build a pavilion to provide shade and shelter during the hot, rainy summer months. About $10,000 of the $30,000 cost of the pavilion has been raised. Dave Bruns said he would also like to install a ropes course. Groups that lease the facilities help support the overall ministry of the camp, his wife said. 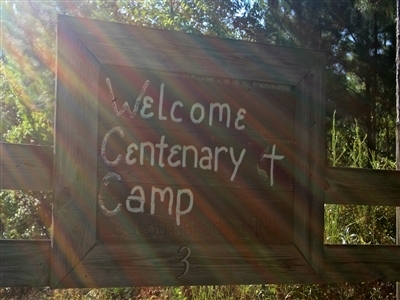 For information about Centenary Camp, click here or call (850) 856-9779.